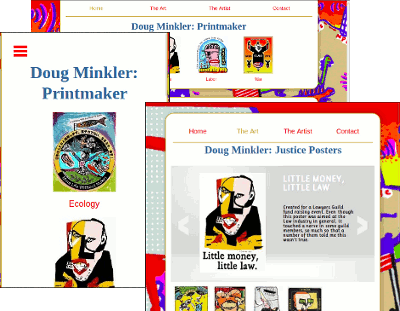 This site was created for a Berkeley artist whose former site was static HTML. As we began the process to come up with a solution, he was clear that he did not want to take on the user responsibilities of a CMS. This client's need for a web site revolves around displaying the entirety of his portfolio, along with the messages attached to the art. I needed to create a solution that would not overwhelm visitors for the user experience, user interface and site performance. We worked together to come up with a modification to his navigation categories. From there I created a design, and gathered libraries and tools from around the Internet to bring his goals to reality. Mobile, Tablet and Desktop views created for responsive design. This was a terrific project, and resulted in a visual feast for those who value the spoken image. 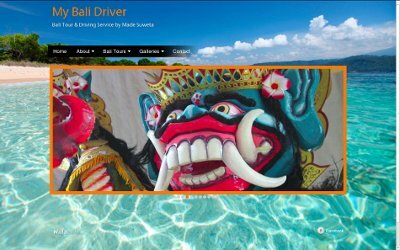 Made Suweta's site for driving and tour services in Bali. The request from this client (who was giving the site to her driver in Bali as a gift) was for an "engaging site with an organic feel." She provided most of the photos for the site, all of which had to be processed for the Internet, along with a video (found in testimonials). Together, we worked out the content that could be shared, and conformed it to a logical navigation system. Once the site architecture was determined, I designed and created two mock-ups, and she chose the second one, saying "I Love Love Love It!!!" Those are my favorite words when I am at the beginning of a project. Everyone who sees the site wants to go to Bali. We met our goals! A Drupal 7 site, I built it in Drupal Gardens. Much customization occurred, including views and CSS. At the time I recommended the platform to this, and other clients, I felt it was the perfect place for small businesses. In many respects, it still is, with the exception of Responsive Design. Much work will need to occur to bring this site to all devices. The request from the clients was to create a simple portfolio site that they could update whenever they had new work. The Oakland Museum was looking at their work as possibly including them into a Spring show. We all had to work quickly. I provided hands on instruction to both clients on how to use both the CMS and Photoshop. We documented all aspects of both trainings. They are very talented artists, and that is what brings the beauty to their site. 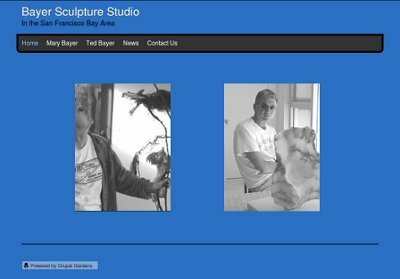 Bayer Sculpture Studio - online portfolio of original sculptures. This is a Drupal 7 site, built in Drupal Gardens. I created custom views and taxonomies to get the sidebars to display the clients' galleries. And, there were a few more tricks performed to get the content to display as desired. 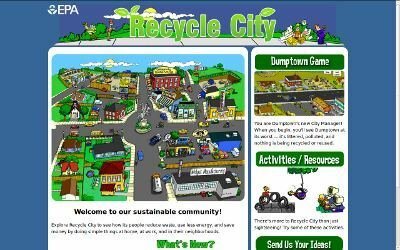 One of my major contributions to the EPA was to modernize the national micro-site, Recycle City, and make it interactive for the kids who use it throughout the country. This is an educational web site from the EPA. Another micro-site I created from the ground up while at the EPA was for Sustainability. Its content was ultimately rolled into the national site from Region 9. In reality, at one point or another, I touched every feature on Region 9's web site. In addition to the experience of working on another large-scale web site, I learned a great deal about how the public affairs department of a major government agency works, which was a first-hand education. 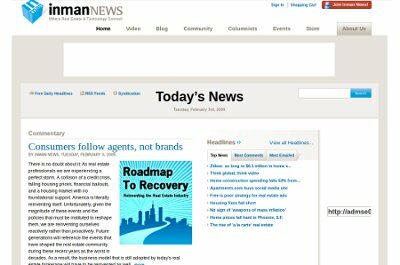 I began working at Inman News, in April 2006, when the company utilized a hodge-podge of software and hardware to accomplish its primary mission as a news service. I maintained the site, and managed the production of the twice-daily headlines emails, and all email marketing initiatives. This involved working with managers from Editorial, Marketing, Events, Membership and Sales. In 2007, the owner tasked our team with the launch of a real estate wiki, based on open source code from MediaWiki. I was assigned maintenance, update and moderation duties for the wiki. Its success led the company to a new initiative, that of moving most of the their technology tools to LAMP and Drupal. A major contributor to this Drupal 5 site, I designed and created the "About" section. I wrote or rewrote most of the copy, designed and created the structure using Book pages and Panels, created the navigation within the feature, and created all pages, CSS and graphics to support the design. My web production ultimately touched all aspects of the [then] new Inman site, including PHP templates, views, panels, content types, books and local and global style sheets. To see the Inman News site(s) I worked on, visit the Internet Archive's Way Back Machine. Their current web site was created in WordPress, and can be seen at: Inman News. I hope you have enjoyed a review of my Web 2.0 Projects online portfolio. I have been designing, developing and deploying web sites since 1999. I love doing both design and front-end development at the same time, and am truly a "right-brain left-brain" developer. Review the portfolio of my work from 1999 to 2005 at: Willa Madden - Early Web Projects.